Lights, buoys - aids to navigation. 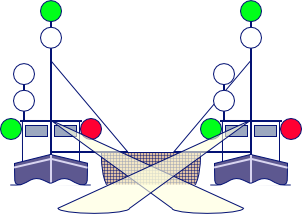 A white light placed over the fore and aft centreline of the vessel showing an unbroken light over an arc of the horizon of 225° and so fixed as to show the light from right ahead to 22.5° abaft the beam on either side of the vessel. 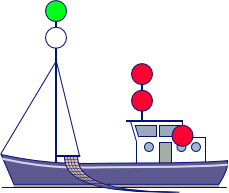 means a green light on the starboard side and a red light on the port side each showing an unbroken light over an arc of the horizon of 112.5° and so fixed as to show the light from right ahead to 22.5° abaft the beam on its respective side. 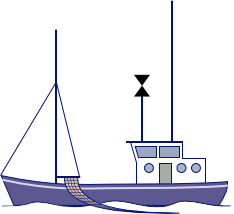 In a vessel of less than 20 metres in length the sidelights may be combined in one lantern carried on the fore and aft centreline of the vessel. 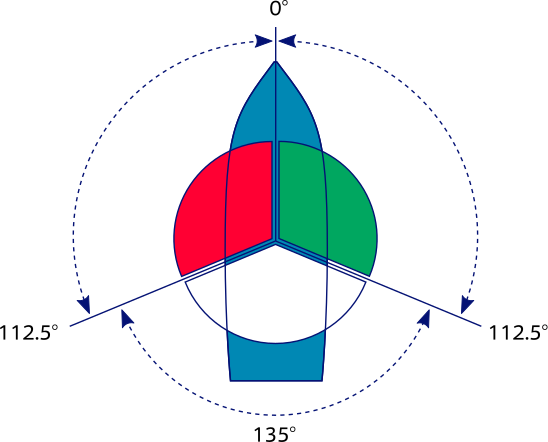 means a white light placed as nearly as practicable at the stern showing an unbroken light over an arc of the horizon of 135° and so fixed as to show the light 67.5° from right aft on each side of the vessel. 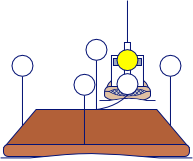 means a yellow light having the same characteristics as the sternlight. means a light showing an unbroken light over an arc of the horizon of 360°. 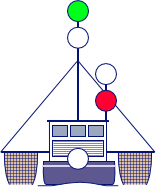 means a light flashing at regular intervals at a frequency of 120 flashes or more per minute. 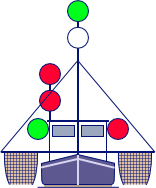 In a sailing vessel of less than 20 metres in length the lights may be combined in one lantern carried at or near the top of the mast where it can best be seen. 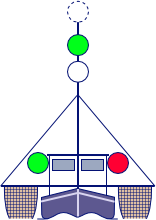 A sailing vessel underway may, in addition to the lights, exhibit at or near the top of the mast, where they can best be seen, two all-round lights in a vertical line, the upper being red and the lower green, but these lights shall not be exhibited in conjunction with the combined lantern. 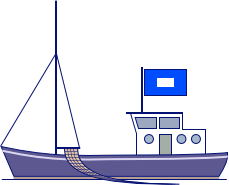 A sailing vessel of less than 7 metres in length shall, if practicable, exhibit the lights prescribed above, but if she does not, she shall have ready at hand an electric torch or lighted lantern showing a white light which shall be exhibited in sufficient time to prevent collision. 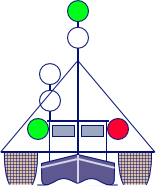 A vessel proceeding under sail which has her engine running shall exhibit forward where it can best be seen a conical shape, apex downwards. She shall exibit lights according to a power-driven vessel. when the length of the tow exceeds 200 metres, a diamond shape where it can best be seen. 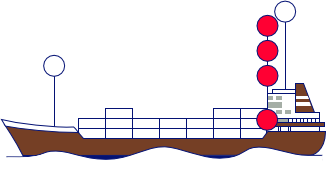 a diamond shape at or near the aftermost extremity of the last vessel or object being towed and if the length of the tow exceeds 200 metres an additional diamond shape where it can best be seen and located as far forward as is practicable. 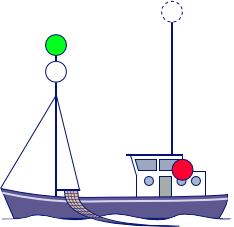 When a pushing vessel and a vessel being pushed ahead are rigidly connected in a composite unit they shall be regarded as a power-driven vessel and exhibit the normal lights. 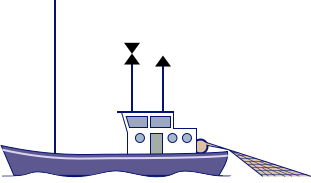 a vessel being towed alongside shall exhibit a sternlight and at the forward end, sidelights. 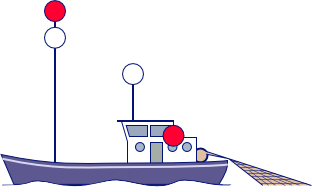 A vessel engaged in fishing, whether underway or at anchor, shall exhibit only the lights and shapes prescribed below. when making way through the water, in addition to the lights prescribed hereh, sidelights and a sternlight. 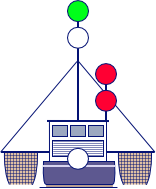 When pair trawling, each vessel shows searchlights on water aiming forward (Flag T by day). when making way through the water, in addition to the lights prescribed here, sidelights and a sternlight. 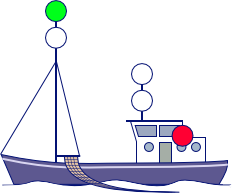 Purse Seiners will exhibit two all-round yellow lights in a vertical line, flashing alternately. A vessel constrained by her draught may, (and not “shall”!) 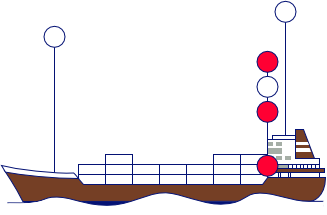 in addition to the lights prescribed for power-driven vessels, exhibit where they can best be seen three all-round red lights in a vertical line, or as day sign a cylinder. when making way through the water also normal sidelights and a sternlight (not shown in the example below). 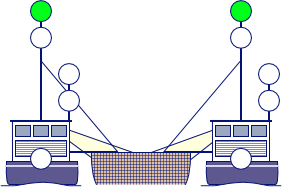 when underway, in addition, sidelights and a sternlight; as shown in the example below. 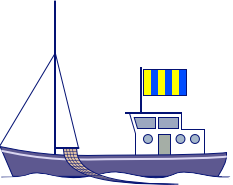 An air-cushion vessel when operating in the non-displacement mode shall, besides a masthead light forward, (plus a masthead light abaft if longer than 50 m) sidelights and a sternlight, exhibit an all‑round flashing yellow light (faster than 2 flashes per second). 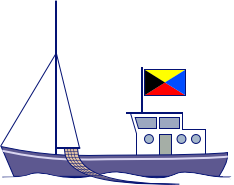 A hydrofoil ferry or high speed catamaran ferry when acting as ferry is often also allowed under local regulations to exhibit an all-round flashing yellow light. 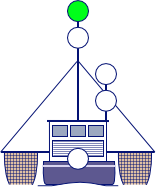 A vessel engaged in mine clearance operations shall in addition to the lights prescribed for a power-driven vessel, or to the lights or shape prescribed for a vessel at anchor, exhibit three all-round green lights or three balls. 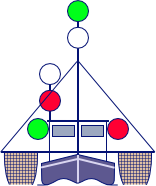 One of these lights or shapes shall be exhibited near the mast head and one at each end of the fore yard. 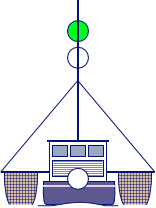 These lights or shapes indicate that it is dangerous for another vessel to approach within 1000 metres of the mine clearance vessel. 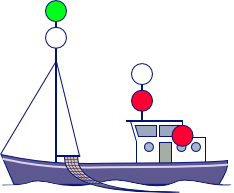 or download the complete navigation course as PDF - including practice materials, exercises and answers.